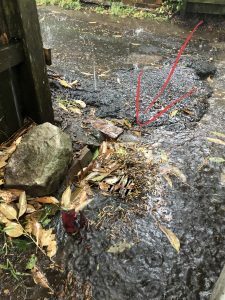 The well needed rain that arrived in Sydney over the last few days has created many blocked storm water drains and grates that can easily be fixed. Take the opportunity in between showers to check any pits or drains around your home that may be blocked by leaf debris or dirt. Put on your gardening or washing up gloves and you can clean them out, it may save you from some unexpected flooding. The drain shown here was covered by leaves and gum nuts blown off in the storm. It wasn’t able to cope with the deluge of water. If your roof gutters are full and overflowing, it may be leaf debris and twigs or even a tennis ball from the summer back yard cricket series blocking the gutter outlets. If you choose to put a ladder upto the roof gutters to have a look, Please be very careful. Take care climbing on your roof. It may be very slippery!